Toyota MR-2 AW11, SW20 - J's Garage Export Co., Ltd.
1984.06 : TOYOTA announced the release of the MR-2(AW11) which is the first midship car in Japanese sport car history. The MR-2 line-up includes the 1.6 G and the 1.6 G-Limited with a 4A-GELU 1.6liter engine that makes 130 horsepower and a choice of 5 speed manual transmission or 4 speed automatic transmission, and 1.5 S with a 3A-LU 1.5 liter engine which makes 83 horse power and a choice of 5 speed manual transmission or 4 speed automatic transmission. 1985.01 : The WHITE RUNNER, based on the G-LTD, features including super-white2 body color, colored spoiler, colored door mirrors and side mud guards, power window, powered door lock, and a front bronze glass. 1985.06 : There were some minor changes including colored bumpers and a rear spoiler, colored side skirts (G-LTD), power window, and a front bronze glass (G-LTD). 1985.08 : The G sports package was added. The G Sports Package, based on the G, adopts the rear stabilizer, side mud guards, 7 way seats, hard type suspension, and RE 71 tires. 1986.01 : The BLACK LIMITED, based on the G Sports Package, features black metallic body color, colored front spoiler, rear spoiler, side mud guards, and exclusive steering wheel and a shift knob. 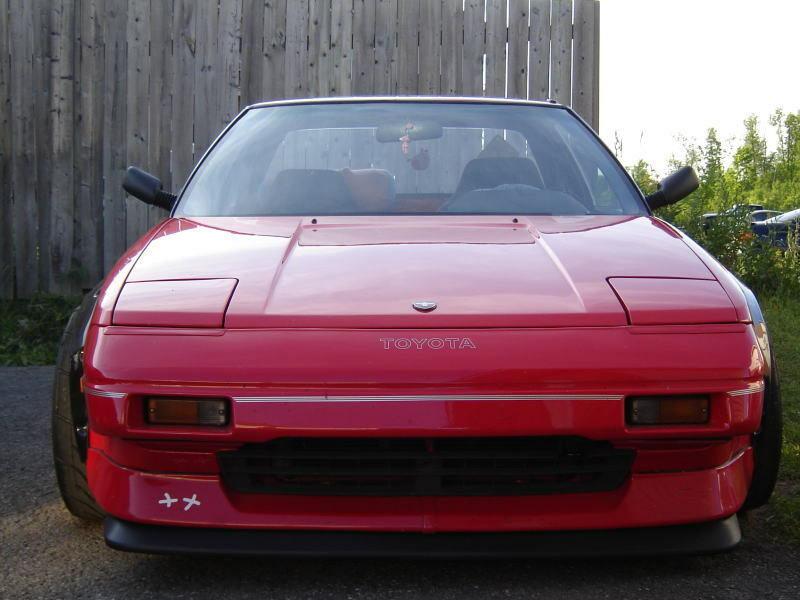 1986.8 : The MR-2 supercharger was launched. The MR-2 1.6G Supercharger is powered by the 4A-GZELU engine with the supercharger that develops 145 horsepower. 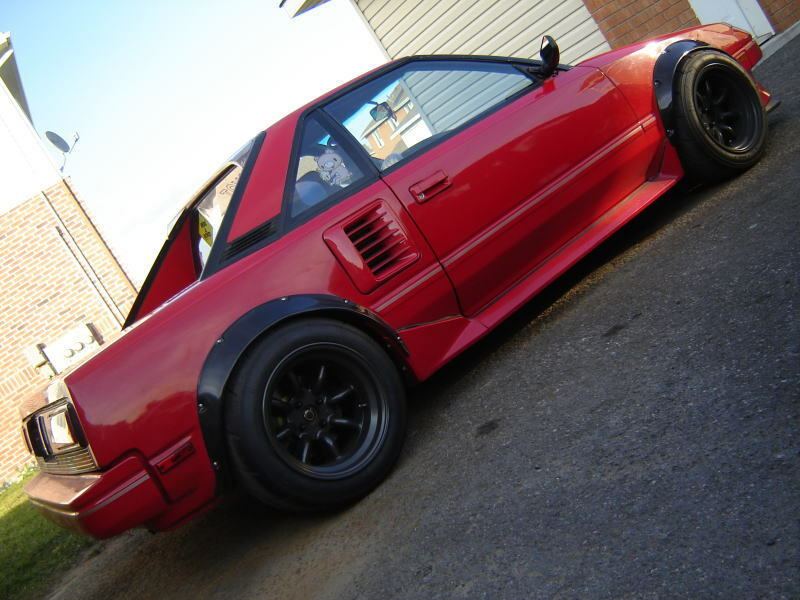 Also, MR-2 with T-BAR roof is added to the MR-2 line-up. A mild facelift includes front spoiler and rear combination lamp design, and side air intake (SC model). 1987.07 : There were some minor changes. 1988.01 : The Super Edition, based on the G-LTD supercharger AD, features white/beige metallic two-tone body color, colored door knobs, colored mud guards, colored alloy wheels, a front bronze tinted glass, leather combination sports seats, leather wrapped shift knob/packing lever, and a leather wrapped MOMO steering wheel. 1988.08 : The MR-2 adopts electrical fold-in door mirrors (G-LTD), colored door knobs, a rear spoiler with high mounted stop lamp, and front a tinted glass. 1989.01 :The Super Edition, based on the G-LTD T-bar roof, features blue mica body color, colored mud guards, Recaro seats, a leather wrapped MOMO steering wheel, front wipers with fin. 1989.10 : The new MR-2(SW20) was introduced. The chassis's performance has been improved, and it was 200mm longer in length, 80mm longer in wheelbase and about 150kg more heavy in weight than the AW11 MR-2. 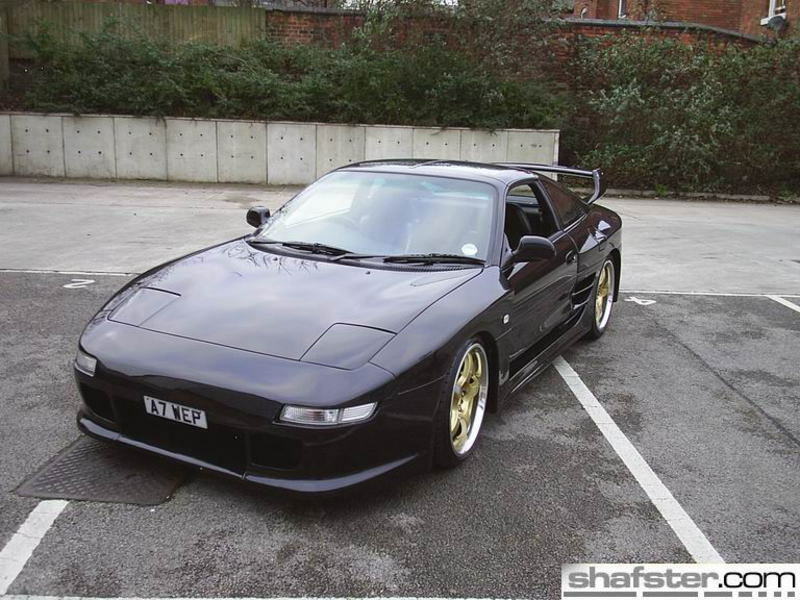 The SW20 MR-2 is powered by the 3S-GTE 2.0 liter, L-4 DOHC turbocharged engine with intercooler,with 225 horsepower. And a 3S-GE L4 DOHC engine that produces 165 horsepower is also available. Front and rear brakes adopt ventilated disc brakes. 1991.12 : All versions got the larger 15 inches tires and brake, and the suspension has been improved to achieve in better at-limit handling stability and driving quality on all conditions. 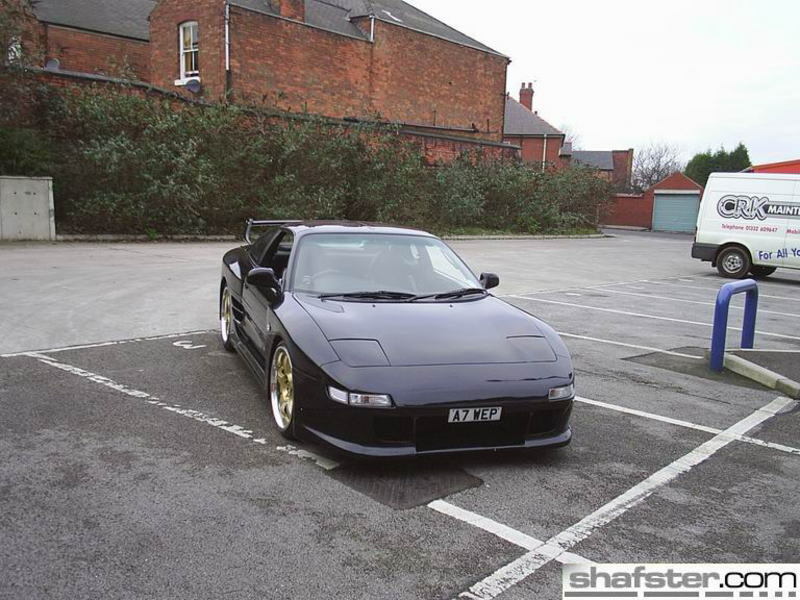 The MR-2 GT adopts Bilstein shock absorbers and a Viscous LSD. 1993.10 : The suspension has been further improved to to maximize driving performance and handling. The improved 3S-GTE engine makes 245 horsepower, and the 3S-GE engine makes 180 horsepower. 1996.06 : The MR-2 adds the dual SRS(Supplemental Restraint System) airbag and the sports ABS which utilized revolutionary state of the art technology giving brake control for all road surface conditions. 1997.12 : The 2.0-liter 3S-GE engine was changed into new BEAMS engine with VVT-i( Variable Valve Timing-intelligent ) that produces 200 horsepower and 21.0kg-m of torque. 1998.09 : The TRD2000GT was introduced. The features of the TRD2000GT are GT racing aero cowl (a front bumper, fenders, side steps, rear fenders, a rear bumper, and a rear wing), a phase-1 modified 3S-GTE engine (ECU, camshafts, head gasket), a high response muffler, adjustable suspension, front/rear stabilizers, and ALUMI-K 18x8.5/18x9.5 alloy wheels. Main Equipment of the GT & GT-S : Alloy wheels & high performance tires, Stabilizer (front & rear), Bilstein shock absorber, Viscous LSD, Sport ABS, front & rear spoiler, High mounted stop lamp, front fog lamps, electric door mirrors, Leather wrapped steering wheel & shift knob, Driver & passenger SRS air bags, power steering, keyless entry unlock, RECARO seats (option), Power windows, Auto air conditioning. Main Equipment of the G-limited & G : Alloy wheels, Stabilizer (front & rear), Helical LSD(option), Sport ABS, High mounted stop lamp, electric door mirrors, Driver & passenger SRS air bags, RECARO seats (option), Power windows, Auto air conditioning. [G-limited] front & rear spoiler, Leather wrapped steering wheel & shift knob, Power steering, Keyless entry unlock.